Likewise celery has negative calories because eating it expends more energy than digesting it provides. I was kidding about the "Geology" joke. The only reason I said it is because I had just seen this. The only food that does not spoil is honey. Indonesia bans more movies than any other country. Honey is the only food that does not spoil. Clearly I am the master at Necco trivia. The Declaration of Independence was written on hemp (marijuana) paper. The Sea Pig can liquify its body to escape predators. 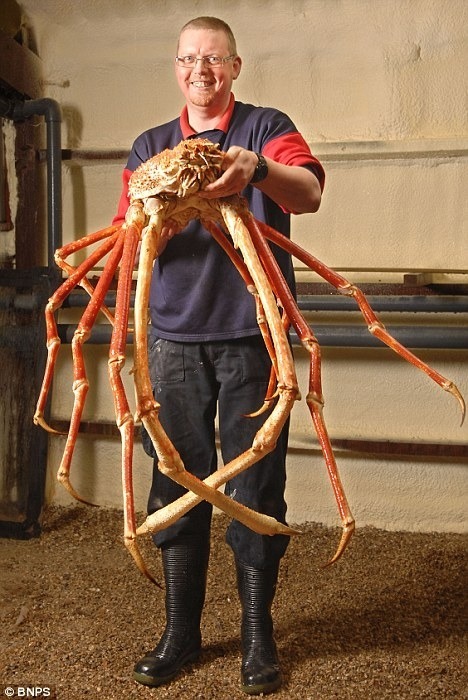 And Japanese Spider Crabs are huge! Speaking of radioactive bananas, Banana Equivalent Dose is a real thing. I suddenly have the desire to attack its weak point for massive damage. There is a type of sea louse that eats the tongues of fish and then attaches itself to the fish to become it's new tongue. That is actually awesome. Like the parasite that makes snails' eyes look like caterpillars so birds eat their eyes off and pass on the parasite in their droppings. Did y'all know that buttermilk does not actually contain any butter. Cats have fur on only one side. Not anymore, they taste like apple now. The new light red ones are the strawberry-bears now. You're right. They changed the flavour in 2007. But they have been, that's strange enough. Monrovia (capital city of Liberia) is the last capital city on the world that does not have a comprehensive power supply. The border between Belgium and the Netherlands cuts the town of Baarle-Hertog into 24 separate isolated islands of Holland inside Belgium and vice-versa. The Koala is the most lazy animal worldwide. He sleeps 20h everyday. Hm, I think they sleep 18 h everyday. -Donald Duck comics were banned from Finland because he doesn’t wear pants. It is possible to go faster than the speed of light in Big Rigs: Over the Road Racing simply by going in reverse and turning in a circle. Most supermarkets place their bakery areas near the entrance because studies have shown that the aroma of fresh-baked goods makes customers spend more money. In South and Central America there is an ant that screams at you before it attacks. oh yea in Soviet Russia alcohol drinks you! That joke is so overused. The "Russian Reversal" joke was invented and popularized by the comedian Yakov Smirnov. ...I would contest that. Ever heard of a trychobezoar (more commonly known as a hairball)? Hippopotomonstrosesquipedaliaphobia is the fear of long words. Just too bad for the hippopotomonstrosesquipedaliaphobic person who was pneumonoultramicroscopicsilicovolcanoconiosis which is a ling condition often seen in coal miners who inhale too much of the dust. "Eleven Plus Two" is an anagram of "Twelve Plus One"! Jordan in Real Genius was based on a real Caltech student who showed up for the interview wearing a sweater she knitted herself because she was bored one night when she couldn't sleep. duct tape is the most useful tool in existence with over 70 different uses. Probably a lot more than just 70. The "Russian Reversal" joke was invented and popularized by the comedian Yakov Smirnoff. The word oxyphenbutazone is the word that was worth the most points in scrabble till now - 1780 points.